I’ve always loved to write and had a career as a singer songwriter for years before writing my first novel in 2006. I wasn’t intending to write a book, but had a great idea for a twist and found myself compelled to write the rest of the story. I didn’t publish my first novel until 2011. Do you only write YA or do you have more up your sleeve? I feel like Young Adult is where I’m most comfortable, and so all my books are in this genre except for one children’s novel, A Shirtful of Frogs. But even my children’s book has a YA feel and is read by all ages. I’m toying with the idea of writing a New Adult novel, but I have so many YA ideas that I don’t know whether I’d manage to find the time to fit in another genre. What is it about YA that appeals to you the most? Do you read other genres? If so, which? I love the angsty coming-of-age drama of the Young Adult genre. Where characters are discovering who they are. They’re making mistakes and diving headlong into precarious situations, or they’re too scared to make a move. It’s all messy and wonderful. As I’m writing these stories, I’m imagining being back at that age and how it truly felt to be neither child nor adult, but something in between. In your own exclusive world that no one else really understands. I read a lot of YA, but I also read a lot of everything else – horror, scifi, chick lit, historical, contemporary. As long as it’s escapist, I usually love it. I’ve just moved house, so I’m still trying to discover where works best for me. I’ve tried the study and that’s pretty good when the house is chaotic (husband/children madness etc). But when everyone’s out and the house is quiet, I find myself sitting on the sofa in the back room which looks out onto the garden. It’s always nice to see a bird or squirrel through the window when I look up from my laptop. I wasn’t one of those children who had a fixed idea of who or what I would be. I was always baffled by children who absolutely one hundred percent knew they were going to be a vet or a dentist or a journalist or whatever. I didn’t have a clue and if anyone asked me that question, my mind would come up blank. I guess I never saw myself in a regular job. What's the title of your latest book? Can you tell us about it? Is it part of a series? My latest novel is Book 3 in The Outside Series. 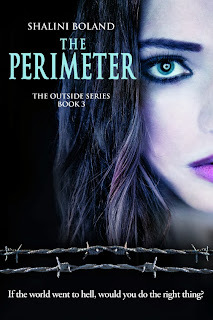 It’s called The Perimeter and is a dystopian adventure set in Britain in the near future. All three in the series feature Riley Culpepper, a sixteen year old girl, who lives a privileged life inside a ‘Perimeter’, a futuristic version of a gated community, which keeps her safe from everyone on the outside. It’s part thriller, part romance, with a few twists along the way. The Perimeter will be released in November 2013. Book 1 in the series, Outside, was the first novel I ever wrote. I had a great idea for an original ending and wrote the whole story around that initial idea. I’ve always been fascinated with post-apocalyptic stories – scary end-of-the-world scenarios - and so it was logical for me to make that the setting for my first series. Only online, lol! I’ve stumbled across forums where they’re discussing one of my books and in those circumstances I tiptoe away quietly. I always design my own covers and spend literally hours … days trawling the internet to find the perfect images. I have a great graphic designer friend who puts up with my terrible rough drawings and garbled instructions, managing to turn them into something wonderful. Thank you, Simon Tucker! I would have to cast complete unknowns in my movie. They would be strong, understated actors and would be propelled to fame by the film’s runaway box office success, going on to have long illustrious careers, but never quite recreating the magic of The Outside Series . . . Sorry, nodded off there for a moment. Tough question. Hmmm, I think it would have to be someone who didn’t take themselves too seriously. Someone left-of-centre like Marisa Tomei (pictured) or Zooey Deschanel. I can so see that, Shalini!! Are you a fan of chick lit? I adore chick lit. All women do don’t they? And if they say they don’t, they’re probably lying ;) To me, chick lit is pure indulgence and must be enjoyed with either a glass of wine or an enormous slab of chocolate and a cuppa. Bridget Jones. I could watch those movies a gazillion times and whenever they’re shown on TV, I always get sucked right in. Second Shift by Hugh Howey, a prequel to the terrifying and brilliant Wool series. And Daughter of Smoke and Bone by Laini Taylor. Her writing is awesome. Awesome I tell you! 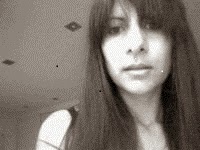 Paullina Simons, who wrote The Bronze Horseman trilogy. I LOVE her. And of course, the imaginative and talented Suzy Turner whom I adore. Speed Round...Top drink to make you tipsy? Southern Comfort or a good red wine. Sky high heels or closer to the ground? I’m a boots and flipflops kinda gal. Love the idea of heels, but I don’t do ‘uncomfortableness’. E.L. James or Jilly Cooper? Love me a bit of Jilly. Haven’t read James. Cry baby or tough cookie? Cry baby. Ask my husband – I’ve been known to sob at some of the adverts. Shalini, you're not the only one! Before kids, I was a singer songwriter signed to Universal Music. But writing fiction has taken over my life and now I’m a mother of two noisy boys and an author of teen novels. I write the kinds of books I love to read - gripping young adult adventures with a sprinkling of romance and a spattering of horror. Note from Suzy... if you're after an amazing vampire read, you really should check out The Marchwood Vampire series by Shalini. It's THE BEST YA vampire series I've ever read.